I really, really wanted to love this book. Nobody loves libraries more than I do and this book is supposed to be a strong argument for supporting public libraries. I wanted to read and love this book and recommend it to everybody who doesn’t support their local library. 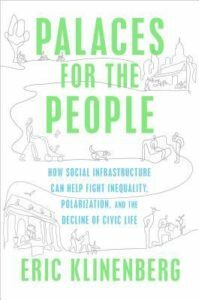 The book discusses the importance of social infrastructure, those things like parks and libraries that bring neighbors together. Klinenberg argues that social infrastructure is what makes people survive in times of crisis (like the big Chicago heat wave or superstorm Sandy). I don’t disagree with his argument, but I don’t need 200 + pages to tell me the obvious. People do better in areas with green spaces, nice libraries, and places to buy fresh food. People will not be happy and healthy if they are surrounded by empty derelict spaces. Abandoned buildings breed violence and crime. Local places where people can gather and become friends are important. Interacting with neighbors makes your life better. I wish the money spent on some of the research he cites had been spent on actual library improvements instead. Klinenberg also goes off on climate change and spends pages talking about Facebook. It would have been better if he had spent more pages on anecdotes and fewer pages being needlessly political. Carnegie was a genius and his building of libraries (which were called Palaces for the People) is the best philanthropic action ever in this country. If you want to read a great book about libraries, skip this book and read The Library Book by Susan Orlean instead. Share the post "Palaces for the People"